2014 Road Trip Photos #16: Nice Park, Charlie Brown « Midlife Crisis Crossover! 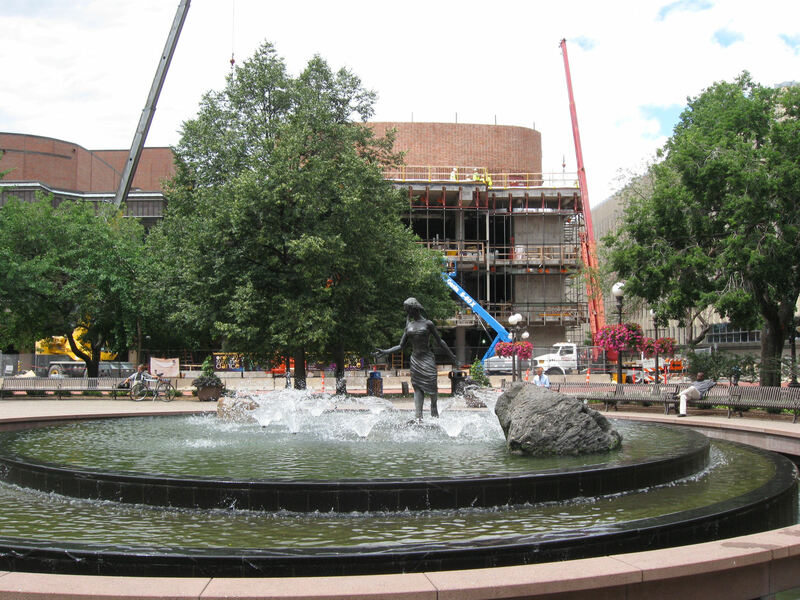 We spent the early afternoon of Day Four walking into the heart of downtown St. Paul with a light itinerary and a curiosity to see if any surprises were waiting for us. 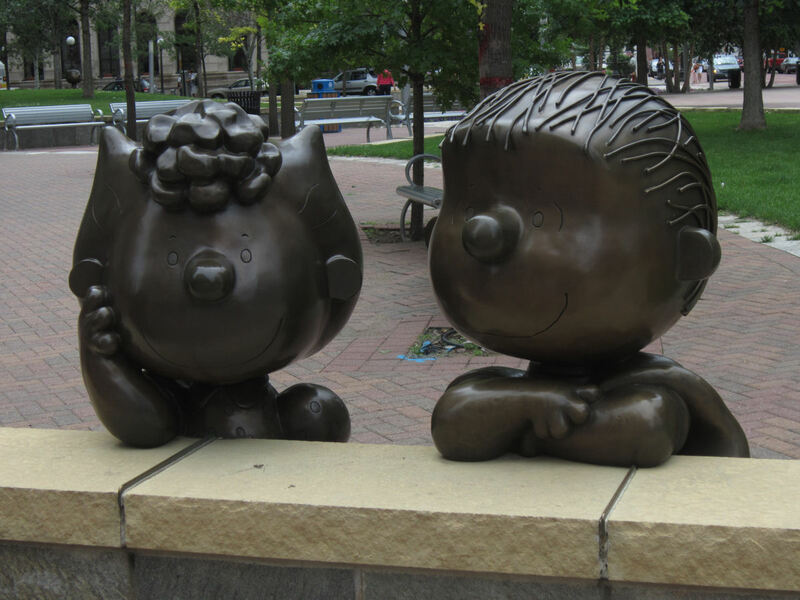 The must-see item atop my list was Rice Park, a modest patch of greenery nestled snugly between eight major structures as a relaxing nexus of life, nature, serenity, and incidental tributes to the great Charles Schulz. 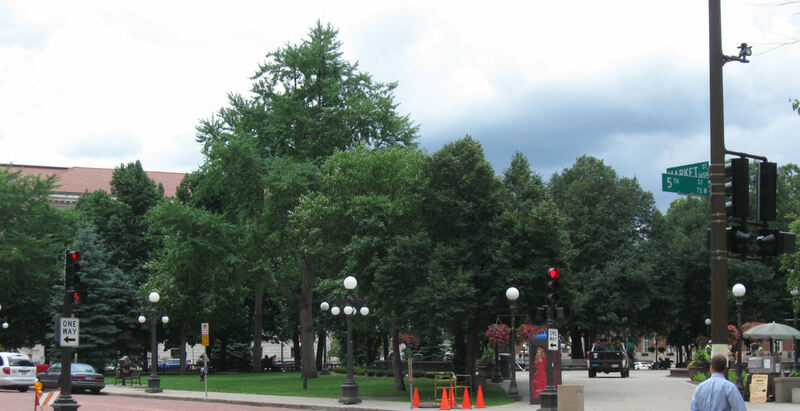 Both acres of Rice Park were designated a public square in 1849, seven years before Central Park received the same nod, but was left more or less fallow until 1860, when landscaping began in earnest. 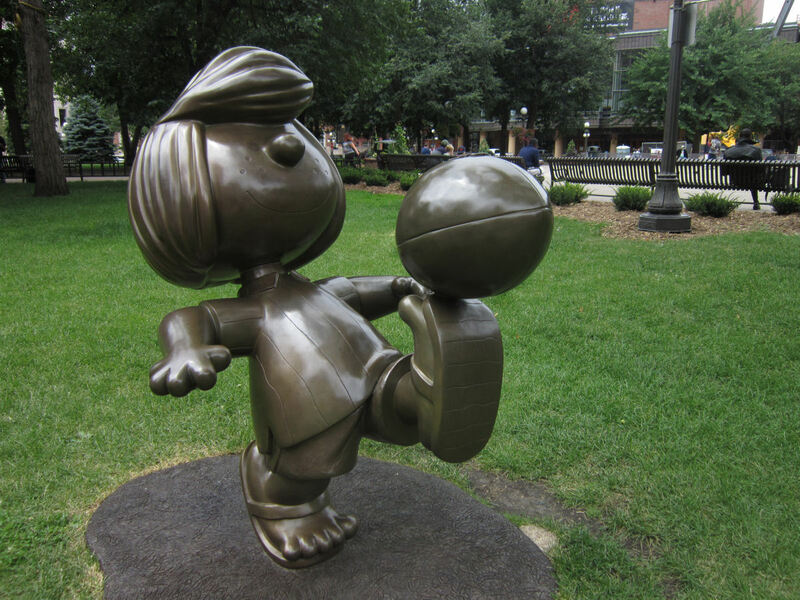 Between 2000 and 2003 the city sponsored a series of statues called “Peanuts on Parade” in honor of hometown hero Schulz, who was born in Minneapolis and raised in St. Paul. 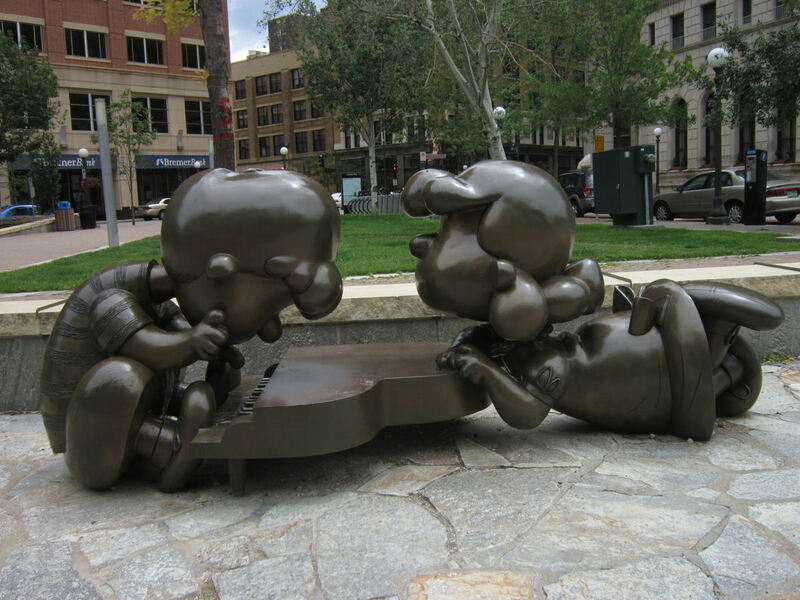 Later those statues were auctioned off, and permanent bronze versions of a few designs were commissioned in 2003 and 2004, including the pianist Schroeder and his unwanted groupie Lucy. Sally Brown basks in the glow of Linus, her sweet babboo. In a rare out-of-character moment, Linus doesn’t seem to mind. Either he’s given up on resisting or he’s been drugged, and someone’s absconded with the all-powerful security blanket that would’ve shielded him from harm. So now the poor, innocent philosopher is immortalized at his weakest possible moment. Good grief! In the lead photo that’s me hanging out with Marcie and enjoying the wonder of the printed page. Frolicking behind us is her best pal Peppermint Patty, preparing to kick a football through a window in the new entertainment venue they’re constructing across the way. 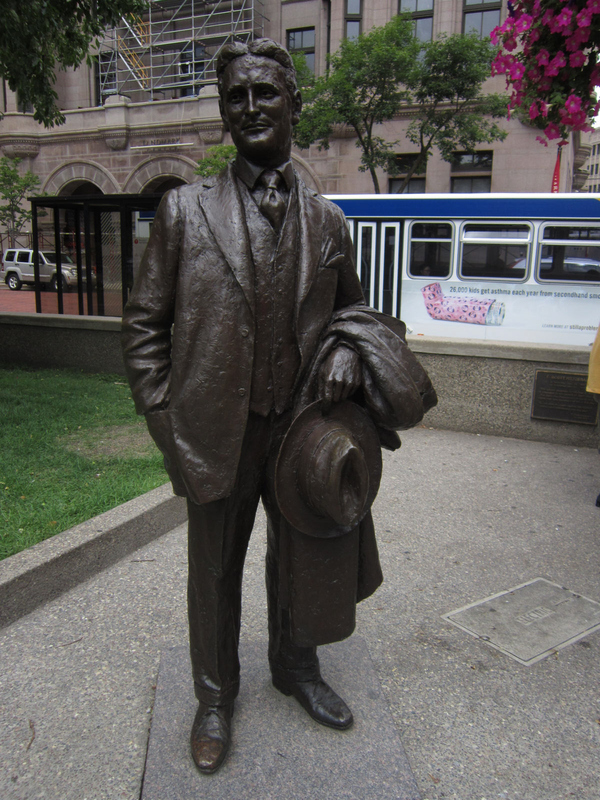 …wait, no, my mistake: this is a statue of author F. Scott Fitzgerald. Someone figured he might as well be added to Rice Park since he was born in St. Paul and lived there till he was fifteen. 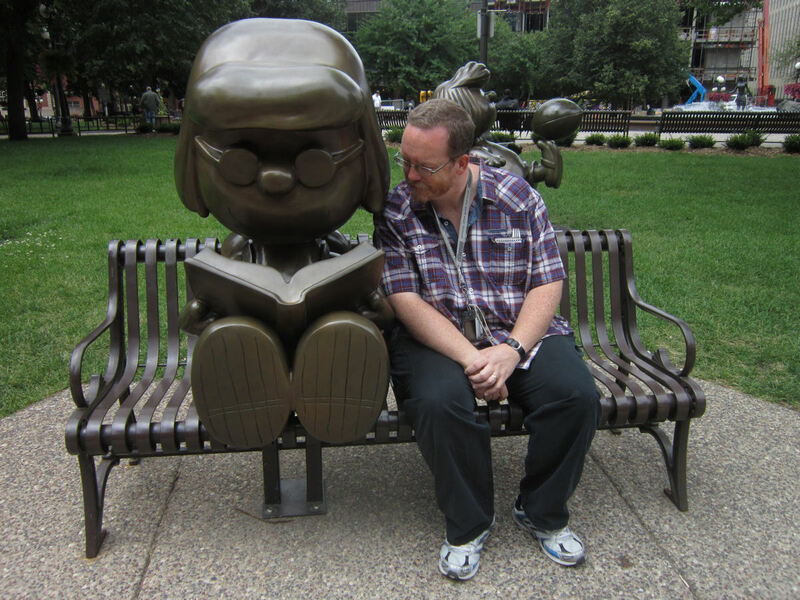 I guess he’s okay, but he’s no Charles Schulz. And here’s the star of the show, the center of the universe, the dependable dispenser of folksy, insightful, sometimes awkward wisdom, someone who’s really resonated and meant a lot to me over the years. 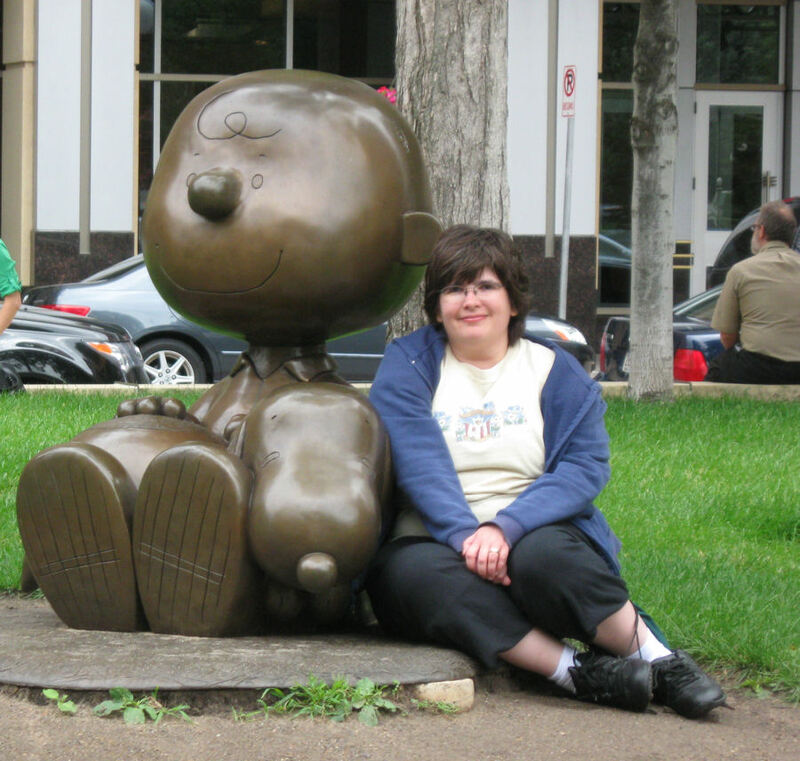 And sitting next to my wife is good ol’ Charlie Brown, celebrated star of newsprint, stage, and screen. He’s acceptable too, but good luck trying to tell him that. Snoopy seems comfy and quiet. Too, too quiet. Meanwhile inside his head, it was a dark and stormy night. 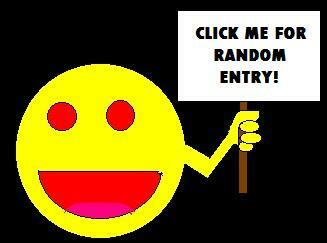 Whu whu whu whu whu whu whu! IIIII II IIIIII II III III I III IIII! Linus without his blanket? Sacrilege. I don’t know what they were thinking. No blanket and he’s smiling anyway! This is clearly not the Linus I grew up with.